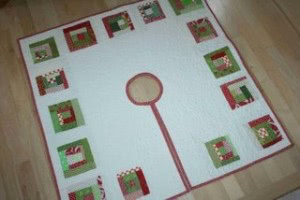 Here’s a great way to use up some of those string pieces of holiday fabric and make a lovely Christmas Tree Skirt. Once the piece is sewn together and quilted, you’ll cut a circle opening for the tree, and bind. As always, Amandajean’s instructions and photos used in this tutorial are excellent.